This Saturday (15th October) sees the Rockers A-team in action on the road as they play in Wales for the very first time. 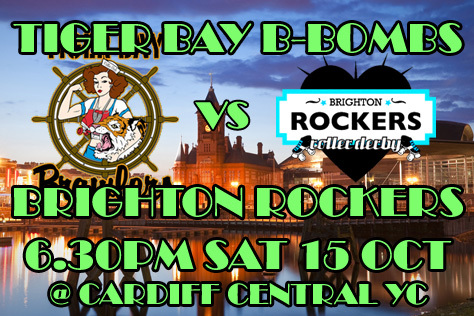 Their opponents are the B-Bombs second team of Cardiff’s top rated Tiger Bay Brawlers. The game takes place at Cardiff Central Youth Club with first whistle at 6.30pm. Tickets are available online for £5 each. Any Rockers fans who have yet to book transport will find trains to Cardiff a little spendy this late in the day. Our tip here is to buy a ticket from Brighton to Bristol Temple Meads, which costs less than £20 each way. Then it’s an hour by National Express coach (£8) to Cardiff. Somehow this works out less than a third of the price of a train all the way! The city has that ‘capital curse’ when it comes to hotel prices and you’ll struggle to get anything for much less than £100 a night this weekend. Staying down the road in Newport is a possible budget option. This will be the Rockers first ever game in Wales. What are your expectations? How does playing 100+ miles from home differ from a local game? Yes, it is our first game in Wales. I’m more Welsh than English genetically speaking so I’m happy in Wales and looking forward to a weekend of my favourite accents with my favourite team. The Rockers are looking forward to the game but we’re pretty sure it’s going to be a tough one for us. The Tiger Bay league have just got stronger and stronger over the last four years and both their teams are so well trained. We love away games and we actually often play better as a result of not having so much organisational behind the scenes prep to do on the day. It’s such a luxury to just turn up and play. We’re often more focused. However it’s always daunting not having a friendly home crowd to cheer you on. It can be a bit lonely when the only cheers that you hear are against you. That’s the one disadvantage about playing so far away – we’re not sure how many fans we’ll have to help us out. Tiger Bay’s A-team have been ranked top of the UKRDA several times over the past few years, so presumably their B-team are no slouches. Do you know much about them and the players/tactics that you might face? Indeed. We are under no illusions. Often B-team players are hungrier for the win because everyone on that team wants to be noticed and make an impact to help them move up to the next level. I don’t know any specific players I’ll be watching out for, but I’m not going to underestimate anyone on the track. Do the Rockers have any new players taking part? Who should the fans look out? Look out for Finn. She’s a newish transfer from Finland originally and has also skated in Ireland. She’s a total powerhouse with some amazing stealth moves. She’s got such a calm presence on the track, which makes working with her a total joy. OH NO WAY! I can’t jinx it. I hope either way it will be close. It’s always best for us when we keep a close game throughout. It really keeps us on our toes, learning and adapting throughout the whole game. Can we expect any more Rockers games (home or away) between now and the end of 2016? What are the league’s plans heading into 2017 and beyond? It’s a big secret so don’t tell anyone but…. we have a pretty exciting possibility of a game in an awesome Brighton venue before this year is out! It’s still in the discussion phase, so fingers crossed… As for 2017 we are taking on new players, aka Fresh Meat, in January so that’s always a great start to the year. As one of the FM coaches I love watching them develop and seeing new talent emerge. We also have some pretty great games against teams from the UK and overseas in the pipeline, so keep your ear to the ground. This entry was tagged Brighton Rockers, Cardiff, roller derby, roller skating, sport, Tiger Bay B-Bombs, UKRDA, WFTDA, women's sport.